Tuesday February 5th 1878. As soon as I got my work done this morning I dressed and went to town. I sat for some pictures and paid up some of my bills. I got tickets for "Jane Eyre" tonight. Rob came home as I did. I was busy ironing and baking all the afternoon and we went to the theater in the evening. Enjoyed it very much. Weather just beoutiful. Pottle paid me $20.00. 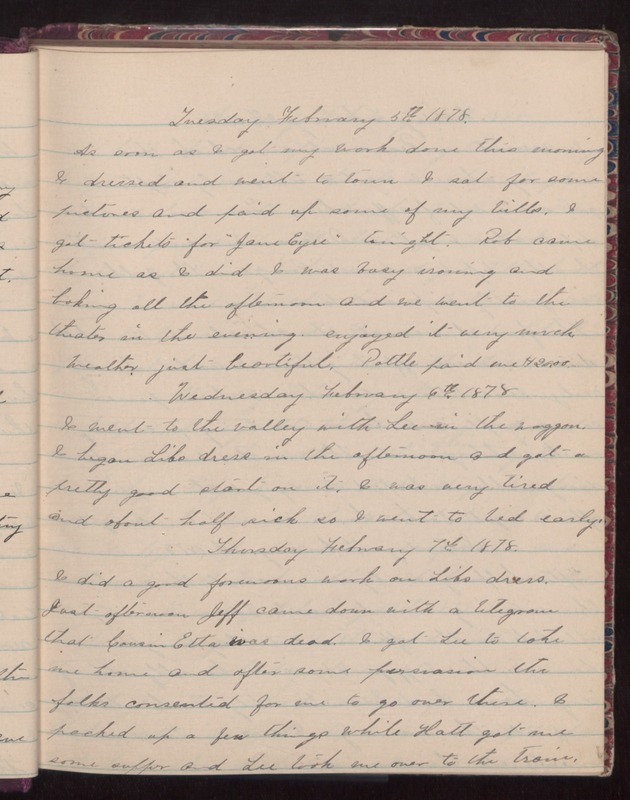 Wednesday February 6th 1878 I went to the valley with Lee in the waggon. I began Libs dress in the afternoon and got a pretty good start on it. I was very tired and about half sick so I went to bed early. Thursday February 7th 1878. I did a good forenoons work on Libs dress. Last afternoon Jeff came down with a telegram that Cousin Etta was dead. I got Lee to take me home and after some persuasion the folks consented for me to go over there. I packed up a few things while Hatt got me some supper and Lee took me over to the train.